Celebrating the sacrament of First Holy Communion is just that, a beautiful and memorable occasion highlighting the Holy Eucharist and becoming a full participant in the Church. Along with the spiritual preparation come the other details of the day which include choosing a First Communion Dress and Accessories and coordinating the festivities after the church ceremony. I remember my own First Communion with fondness. At school we prepared for months with nearly our entire second grade school year devoted to preparing for the Sacrament of First Holy Communion. At home there would be a big party with family and friends. The only sticking point for me and my mom was that I was a slightly overweight child. I loved to eat and my tummy showed it! Finding a plus size first communion dress for a cute buy pudgy child thirty years ago was certainly a challenge. When we finally found the one dress that fit, we purchased it and my mother watched my eating carefully so that I didn’t out grow it by the time of the May Communion date. Thank goodness we have so many more choices today when it comes to shopping for a First Communion Dress. Not only are there more dress styles, there are more sizes, and most importantly there are more ways to shop for them. Can’t find a local retailer selling Communion Dresses? Or you just can’t find a large enough selection? No problem, shop online! At the Catholic Faith Store we carry everything from budget dresses to designer First Communion Dresses with names like Christie Helene, Joan Calabrese, Sweetie Pie and more! www.CatholicFaithStore.com under First Communion Dresses. Please don’t assume that because your child wears a size 8 in clothing that she will automatically be a size 8 in her communion dress. ALWAYS reference the size chart as some dresses run small and others are cut with generous proportions. The size chart measurements provided are for the finished garment. If the measurements are on the cusp of the size consider the next size up. If you have any questions regarding sizing call the store, we are happy to help. Toll Free phone number (800) 625-4610. Local / International customers phone +1 (919) 249-7120. The First Communion shopping season starts in January and peaks at the end of April. In order to be guaranteed the dress you want we suggest you start shopping in February. This will allow you plenty of time to find the right dress, make alterations and allow for a dress to be made to order. Although you will always find a dress closer to the First Communion date keep in mind that some dresses are made to order. 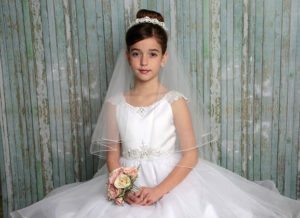 Every Communion season we see a new line of Communion Dresses by our manufacturers and distributors. Just when we think the dresses cannot get lovelier, they do! This is because like all apparel, First Communion Dresses will change with the fashion of the day. There will always be classic and traditional First Communion Dresses as well as more contemporary styles to choose from and each season we ooh and aah at the latest creations. What style is chosen will depend on your person taste and what you consider a beautiful dress. Some will prefer a traditional and simply designed dress, others will choose a more elaborate dress based on their family customs and ethnicity, and some will want a something very contemporary. But with so many choices where to start? The vast majority of First Communion Dresses worn in the United States are pure white. In many Latin American and European countries dress color can vary from pure white to ivory. If you are considering anything but a white dress, we strongly suggest you contact your parish for what may or may not be appropriate. A Communion Dress with Sleeves or Sleeveless? The answer is, it depends. From a shopping perspective there are more sleeveless First Communion dress options to choose from than there are dresses with sleeves. Your church may insist that shoulders are covered during the First Communion ceremony and if that is the case you can simply purchase a shawl, jacket or cape to be worn during the ceremony. Short sleeve and long sleeve dresses are traditional styles and do not require a cover up. If in doubt, contact your local parish or First Communion Director. For a dress with sleeves you can choose from a cap sleeve which hangs over the edge of the arm. This type of sleeve does not require additional cover up during mass. A short sleeve dress is a traditional sleeve that covers the entire shoulder. Three quarter length sleeves will reach the elbow and long sleeve dresses will reach the wrist. Sleeveless dresses come in either a thin spaghetti straps. Many spaghetti strap dresses are paired with a bolero type jacket. Thicker straps and traditional sleeveless dresses will not be paired with a jacket but you can purchase a jacket, cape or sweater separately. A First Communion Dress should always fall below the knee. This means that some flower girl dresses, as pretty as they are will not be appropriate for use as a First Communion Dress. The length of First Communion Dresses will vary from just below the knee, to tea length (mid-calf), to floor length (touching the ankle). 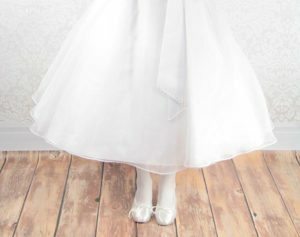 The majority of First Communion dresses are tea-length but many more families are opting for a floor length dress and the selection of floor length communion dresses is increasing. If your child is a little or maybe very overweight finding a dress might be difficult in a local retail dress shop. But the Internet has made shopping for a plus-size communion dress very easy (as long as you take measurements and follow the size charts). Many First Communion Dresses come in what the industry calls half-sizes. These are plus size communion dresses that are exactly the same as their regular sized counterparts, but have been specifically sized to offer more space in the waist area where it is needed the most. If your child has an apple or pear shape, a plus-size dress will be ideal for sizing. In our opinion the most flattering First Communion Dress style for a plus-size girl is an A-line dress. That is because an A-Line dress is fitted at shoulders and chest and at the waist gradually gets looser. An a-line dress is flattering on every body type! Especially if you have a bit of a tummy an a-line dress will create a slimming effect. An a-line dress is fitted at the top and then gradually flares out in an A formation. A-line dresses are typically made of a good quality satin and can be plain or embellished with various appliqués. The most popular of the First Communion dress styles is the princess cut. This dress has a fitted top and a puff skirt. The extra tulle fabric in the skirt creates volume and most young girls love to twirl about when wearing this type of dress. An illusion or sheer top will always draw attention to the top of the body and works well with a slim body type. Also keep in mind that if your child has sensitive skin, some sheer organza tops or sleeves can feel “itchy” so it is important to try on the dress to see how it feels. A dress that has a high waist and flowing bottom will have a very romantic look about it. The waist sash is very pretty on these dresses and are sure to be a comfy fit as the dress will not cling or pinch. A pear-shaped or heavier girl would not be flattered by this type of dress due to the flowing fabric around the hips and waist. A sash belt or waist band is a beautiful dress option as it provides a focal point for the dress and in many instances the tie back of the sash helps to hide a dress that may be just a little too large. Adding a floral appliqué to a first communion dress is both fun and elegant. Weather the floral accents are on the top or the skirt they will be a timeless addition to its styling. Tiered skirts are simply gorgeous. The tiers add volume to the skirt and a visual interest to the dress. Climate will often determine what First Communion Dress is selected. In warmer climates you’ll want a lighter weight airy fabric such as cotton or linen or a light silk or satin with not too many layers. Short sleeve or sleeveless dresses will also work in warmer climates. If you live in cooler climates wearing satin, silk or taffeta dresses will make for a warmer dress. Many of today’s communion dresses are strapless or sleeveless so keep in mind that you may need to purchase a white sweater, wrap or cape to cover the shoulders and keep the child comfortable. A First Communion Dress can vary in cost from under $100.00 to over $500.00, so knowing your budget is important. An expensive dress will not always guarantee the best dress for your child as style and fit are the keys to a great dress. Buying a more expensive dress will typically mean two things. First, the quality of the material used is more expensive to source and will use finer materials such as silk. Second, the craftsmanship will be greater. More expensive dresses are a combination of machine and handmade and will offer a greater degree of workmanship both in the sewing and application of embellishments. We hope you’ve found this advice useful and that you have a blessed and stress-free First Communion celebration!